“I began in a senior vet role before an opportunity came up for a clinical director position. It wasn’t something that I would have actively put myself forward for but the team recognised something in me that I hadn’t recognised myself and encouraged me to apply. Now, I’ve realised my potential and have been in the role for over a year and a half, with fantastic support to nurture and develop my business and leadership skills along the way. This is something I hadn’t received previously but which is so important as part of modern day practice. Leadership and business development support for vets is something that’s massively neglected in the profession, but it’s something that’s done really well here. Vet school feels like a long time ago, but I remember feeling that in order to be a very good vet I had to aspire not only to clinical excellence but also to develop the best possible communications and management skills, as this is such a vital part of working with animal owners and handling difficult situations well. There was some support during training to help with this, but not nearly enough, and it’s so important that vets have these wider skills. The leadership and management experience that I’ve built here has helped me to become the right kind of professional and to uncover opportunities that I never thought would be there. I’m currently in the middle of a leadership programme that has been a big help to my professional development, where we learn not only from leadership and business experts but also each other. This pushes me by offering a structured learning programme with the senior leadership team, but what’s most valuable is the chance to hear and learn from each other within the business. We’ve all got a really wide variety of skills and have lots of insight that we can bring to the group. We also have leadership and management sessions within our own clinics too. In addition to this support, I’ve also benefited from having one of the senior leadership team as a mentor: having regular contact to help me develop and progress on my own personal development plan. 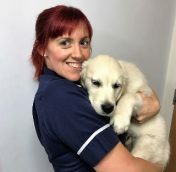 “I’ve been with The Vet since January 2016. It’s a great company to work for: the team is really supportive and the support office is always there to give you a hand if you need it. When it comes to CPD, there’s a great culture of learning here, with everyone getting a full week each year to spend on developing the skills that they’re interested in. The team is open to hearing how you want to use your CPD time and have trust in your decisions. I’ve used my CPD time to further my experience around trauma, emergency and critical care. One of the things I most enjoy about working here is that they take your personal development seriously. I like the fact that you can be completely self-sufficient. 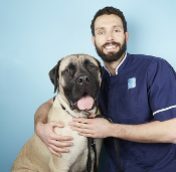 When I was at vet school, my main aspiration was to work in a small animal clinic where you can complete a job from start to finish. I never liked the idea of sending animals away; I wanted to have responsibility for delivering every aspect of their care and now I can do this. You can’t beat the infrastructure here – the clinics are unparalleled. Everything is done on site which is really important for me. Having gold standard facilities and support to pursue your specialist interests means that you can get more experience working in the areas that you’re most passionate about. Orthopaedics is something I was particularly interested getting more experience in, and having the right space and facilities have allowed me to do this. As well as having the chance to pursue my clinical interests, I’ve also taken on more leadership and management responsibilities here. At vet school you do not learn anything about business management but it’s such an important part of modern practice; The Vet recognises this and gives you the opportunity to take on this responsibility if you want it. 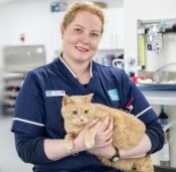 “I’ve been working at The Vet for three years and have been recently been made a deputy clinical director. This was a spontaneous move for me, I’d learnt from seeing others in the role and thought I had the skills and ambition to do it, and the team around me were really supportive and encouraging. There are lots of new skills to gain experience in as part of a management role, after all we went to vet school, not business school! I’ve had great management and coaching support to help me feel confident evolving the business skills I need as a deputy clinical director. In the future, my plan is to work towards becoming a full clinical director. It’s great to have a career structure and an ambitious goal to aim towards here – this doesn’t happen in other practices. There are no boundaries to anyone within the business here: everyone’s happy to be contacted and to offer advice. I’ve found this aspect of support really valuable. “The great thing about working here is that you feel truly listened to. You can bring new ideas for running your practice and then be given the freedom and encouragement to get on with doing them. 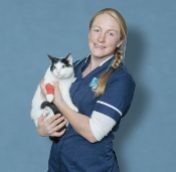 When I started, I had the idea of introducing a new graduate scheme with a particular focus on the increasingly broad non-clinical skills that vets need today. Rather than facing lots of barriers, I was given the support to start planning and implementing it quickly, and we’ve just launched the new scheme. Graduates spend two days with us every two months, completing a variety of continuous professional development tasks but, perhaps more importantly, spending quality time getting to know and support one another. I’ve concentrated on helping graduates develop their softer skills around things like coaching and communication techniques, as well as advice on how they themselves can manage their own wellbeing, as this is so important for vets today. We’ve had students coming through regularly and have had really good feedback on what’s worked and what hasn’t. I’ve had non-clinical skills training at other practices but the support on offer here really stands out. I’m currently over halfway through my leadership training, which involves travelling down to London once a month for different sessions. It’s always nice to have a change of scene from the clinic and to meet other vets that are going through similar experiences in their careers. We talk about specific skills that are particularly important for vets in leadership roles, things like giving feedback during appraisals. The fact that The Vet also employ practice managers with business backgrounds is fantastic and I’ve learnt a great amount through this. 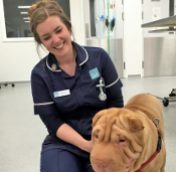 “While I really enjoyed previous roles, I felt frustrated that in general, vets were not involved in the decision making process within the practice. I often felt I had good, modern ideas that were listened to but not taken seriously or actioned. I know others felt the same yet this was accepted as the norm. There was also no real encouragement to improve non-clinical skillsets, such as business and leadership skills. There were no appraisals, no training within the team and no real opportunities for career progression. The Vet’s different. Here, we have a much more modern approach, with collaborative team who make decisions together. Regular appraisals help you identify where you are in terms of your role and career progression and you learn where you can create an even more positive impact within the practice and also ensure that your own needs are being met. As a senior member of the team, appraisals also provide a platform for your voice and a chance for you to give your opinions, where you can talk about any new ideas you have for the practice as well as professional development opportunities that you feel you would benefit from. There are real opportunities to progress both clinically and non-clinically. 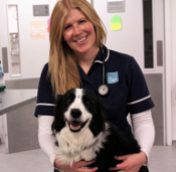 The business and leadership training here is really valuable for experienced vets that are looking to progress to the next stage of their career, but who might not otherwise have the chance to build their non-clinical skillsets which are becoming an increasingly important part of modern practice. 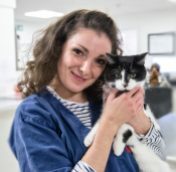 The opportunity to learn from experience professionals from a non-veterinary background is hugely valuable, and you feel that your own career development is taken seriously. The training here allows you to grow and learn about yourself; and this in itself provides you with a set of sustainable skills you do not gain from vet school.